I’ve known Kim Jones and her family for nearly two decades. Kim’s mother, Di, founded one of Sydney’s most successful premium boutique real estate agencies, Di Jones Real Estate, located in Sydney’s Eastern Suburbs, in 1992. Kim took over the reigns of the business 11 years ago and runs it with the same tenacity, seven-days-a-week determination and whatever-it-takes principles that Di founded the business upon. I’ve witnessed first-hand Kim closing real estate deals while at the gym at 6am, at a Sunday brunch with girlfriends and a few hours after she gave birth to her fourth child. My long-standing respect and love for Di has been matched by my pride in seeing Kim not only live up to what was a pretty lofty succession plan but surpass it, bringing her own style and flair to the business. Part of that succession plan has been Kim’s ability to bring an impressive new management team into the business … in many respects the ‘new guard’ who are, together with Kim, now steering the Di Jones brand into a new era of growth. And it’s that unique combination that has recently seen the Di Jones brand attract global PR attention with a simple initiative based on a social insight that would have been overlooked by most people. 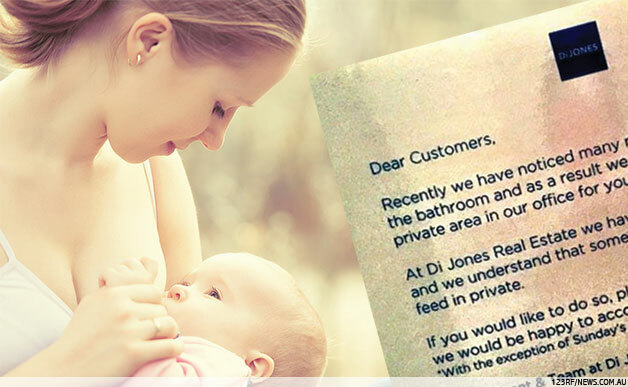 General Manager of Di Jones Real Estate, Kylie Walsh, after witnessing a woman feeding her child while crouched on the floor in their shared public toilets, decided enough was enough. Kylie, backed with the support of Kim and the Di Jones management team, took matters into her own hands by opening a room in their office to the public, for breastfeeding mums who want to escape the glares and judgement as they breastfeed. After posting a simple poster on the front window of the Di Jones office, the initiative not only took off but it went viral, making news across the world and generating an estimated $1-1.5 million dollars in exposure for Di Jones Real Estate. This was obviously not the original objective of the initiative, but according to Kim, the publicity has created a powerful talking point with the local community. Register to be a ‘source’ at www.sourcebottle.com.au … an online resource that links journalists with story content providers. Twice a day you’ll be emailed a list of stories that journalists are seeking comment or content for. If it’s something in your field of expertise, you simply get in touch with the journalist directly and hope they decide to include you! Celebrity seeding: Make a list of 10-20 celebrities that suit the target audience for your product or service and send them a free sample – directly or via their management representative. You never know – they might tweet or facebook it and your product or service could suddenly be exposed to thousands, or hundreds of thousands of people. Podcast interview: Being interviewed by a thought leader in your sector is one of the fastest ways to boost your profile. Search for the top podcasts in your industry or sector and approach the podcast author to be interviewed. Have an opinion, angle or a point of view and your interview could expose you to a targeted audience of thousands.